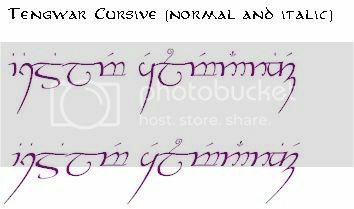 Hi everybody and welcome on the third Official Tengwar Transcription Thread !!! 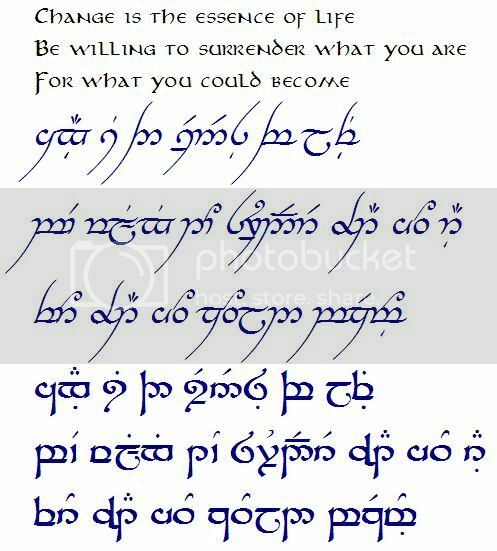 So you can post here all the Tengwar transcription you need. 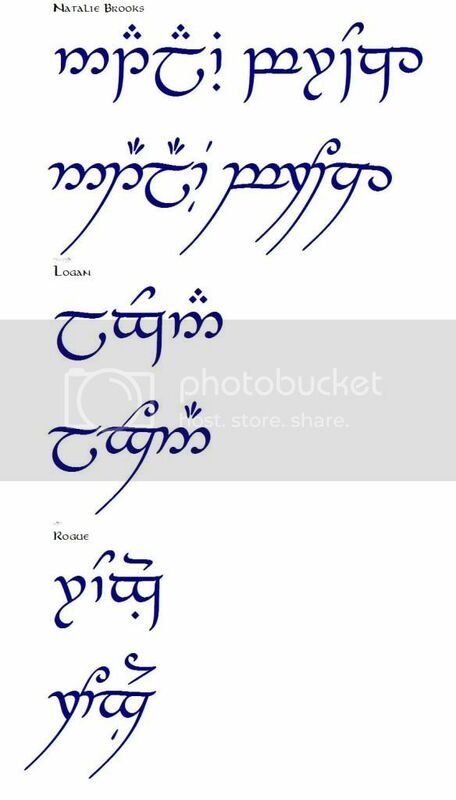 Notice that Tengwar is not a language : it’s a different script, a different manner to write the letters and sounds. 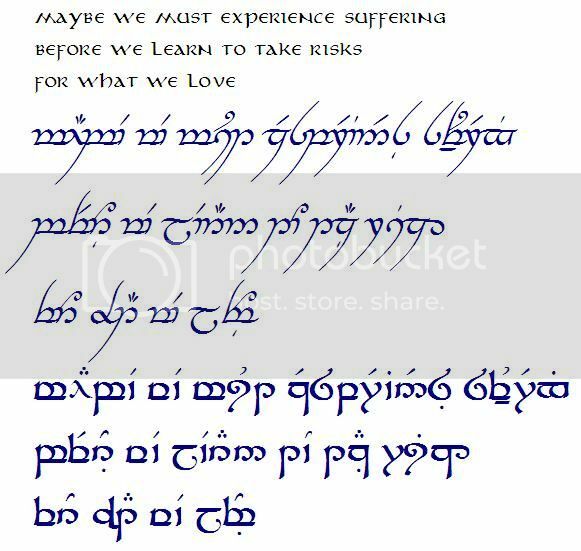 So if you want your word/sentence to be translated in an Elvish language before transcription, then you may post before in the appropriate translation thread. For Quenya, go on the Official Quenya Translation Thread, and for Sindarin, the Official Sindarin Translation thread. 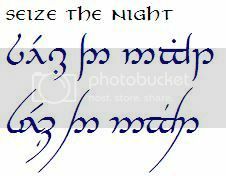 Then come back with the final sentence and ask for transcription in Tengwar. 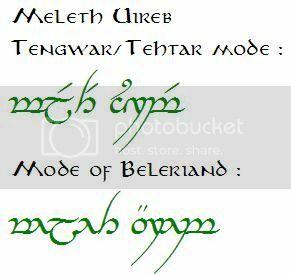 Another way to do it is to keep the word in English (or whatever other language) and transcribe it directly in Tengwar. If your request is in another language, I suggest you tell us in what language it is, so we may use a transcription mode which is more appropriated to the starting language. The more details you give, the more easy it is for us to give you a good answer. Talking about this, notice too that there is never a unique good transcription for a word. Tolkien created a lot of transcription modes and that is the reason why you can have a different answer asking to different people, and both can be good ! For the moment, I seem to be one of the only ones answering the requests. I have to tell that I am no moderator or any official reference in TORC. I'm just someone who discovered this site and got some a little help from other bloggers here, and I decided, as a elvish fan, to help others elvish fans with the knowledge I accumulated with the years. And over all, I just looove to do this : translate and transcribe. So the transcriptions I offer you reflect my opinion... but as far as I’m concerned, they're accurate... or at least as accurate as we can attest with the information that Tolkien the great Master let us. As I said, many transcription modes are circulating... If someone else is interested in doing some transcriptions here too, just tell me and we’ll split the job ! There are in fact other transcribers helping from time to time and that’s great ! Now here is the way I’m personnally working : I take note of every request and try to do them in order, with some exceptions if I have a very good reason ! If you post a transcription you made by yourself that you want me to check, I usually work on your request quicker. And please, no double-post ! So note that I’ll start with the last requests that were made on the second transcription thread which is now closed, and then I’ll go on with what will be posted here. You can also visit this thread and the first transcription thread if you want to see examples of what I do (I have started transcribing on these thread in January 2010). One last thing : please be patient. I have a lot of work and I can put the transcription in my computer and then transfer in on the thread just when I’m home and have free time, which doesn’t occur that often. But I’ll end up doing your transcription, don’t worry. And sorry for my horrible English... you may have noticed that it is not my native language at all ! Now here are a few examples of fonts that you can ask for, using my name as an example. All can be in bold too, if asked. If you have other fonts and would like to know if they fit too, just send them or post a link to them ! 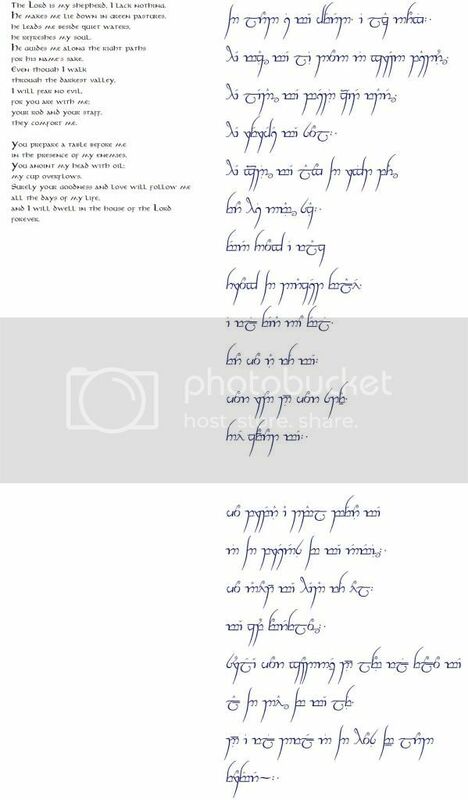 And here is a list of some Tengwar fonts that are incomplete or not compatible with my system, so I suggest we don’t use them if possible (I post the list in case you know these fonts). P.S. : to add a new comment or request, click on “Post a reply” at the top or bottom of a page, not on “Post a new topic” ! Last edited by Isildilmë on Wed Mar 30, 2011 6:00 am, edited 3 times in total. 2 - The pronounce is more simmilar to "Cayo", and all the vowels are pronounced separately. Ah, just to help a little more, "Cesar" and "Soster" are in Portuguese too (duuuuh'), and the pronounce are simmilar, talking about the vowels. It's more like "César" and "Sóster". It's a little different from the english, but not too much. If there's anything else i can do to help you, just ask. OK ! I found a mode to transcribe Protuguese names/word which is very complete and well done, so I'll use it. I just want to check something before : is it "Cesar" and "Soster", or "César" and "Sóster" you want to transcribe ? It will defenitly affect the result ! And don't worry about your English, mine is horrible, so I can't judge you ! OK ! I work quite hard this w-e to finnish all the pending requests. Here we go ! For Anduril92 & broox159 : Here are the links to your transcription in larger size as asked (they are too big to fit this thread). Last edited by Isildilmë on Mon Mar 28, 2011 1:44 am, edited 1 time in total. Last edited by Isildilmë on Mon Mar 28, 2011 1:47 am, edited 1 time in total. 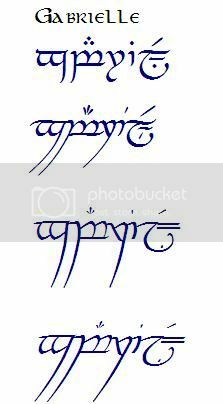 I showed you the two ways we can write Sindarin with Tengwar. I almost never comment the quotes I transcribe, but… should I be worried about this one ? As I remembered that you had asked for regular and italic last time, I did both this time too. Last edited by Isildilmë on Mon Mar 28, 2011 1:48 am, edited 1 time in total. 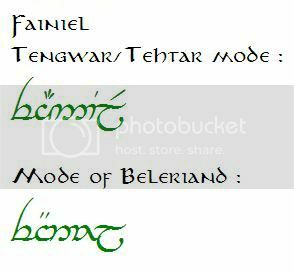 For sf702 : As you told me twice that you wanted Tengwar Annatar and Sindarin, that’s what I did… but in neither post you precised if you wanted the italic style or regular style, so I guessed that it was Tengwar Annatar italic and Tengwar Sindarin Regular (as you can see here). If I guessed wrong, tell me. Last edited by Isildilmë on Mon Mar 28, 2011 1:49 am, edited 1 time in total. Last edited by Isildilmë on Mon Mar 28, 2011 1:50 am, edited 1 time in total. Nice to see that you appreciated my last transcription enough to come back ! I did these ones with a Spanish transcription mode I always use for Spanish quotes. For flyingduster : A long time as indeed passed since the first request I did for you ! Here are the new ones ! Last edited by Isildilmë on Mon Mar 28, 2011 1:51 am, edited 1 time in total. For mat85 : Finally, as I had a little time for transcriptions, I didn’t wait for your answer to my question and I did both English and Quenya version of the name ! For piscaum : your transcription are almost ready, I'm just waiting for your answer to my last question. (I post this message here because normally it would have been your turn to be answer at this point). Last edited by Isildilmë on Mon Mar 28, 2011 1:52 am, edited 1 time in total. For Michael of LaSul : It’s always a good idea not to be to confident with those automatic generators… I sometime use them as raw material, but I almost always have to correct the transcription it offers, even with the best websites. In your case, it would have been scattered with a few errors. For man-yoo : As I told you in my answer to your email, the hyphen in Tengwar and English are not the same… Here I offer you two transcriptions : in the first one, I used a dot, because it can represent the English hyphen (or also the English coma) in Tengwar. In the second one, I let the hyphen as in your transcription… I normally use it to represent the English semi-colon (;). 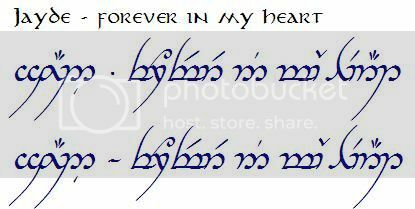 So the first transcription means [Jayde - forever in my heart] or [Jayde, forever in my heart], and the second means [Jayde; forever in my heart], but I guess that in all cases, the meaning of your phrase is preserved, so you may also choose with the look ! And now I'm done (except for piscaum - coming soon) !!! And I want to say that this is my 1000th post here at TORC ! Yé ! I never thought I would get that involved in this website when I first discovered it and realised that there wasn't anybody anymore to answer people, neither did I think that I would spend so much time in this ! I estimate I did around 1400 transcriptions since my arrival in January 2010 (about 100/month...!) . And still holding on ! That's what I thought. So I'm already done with your transcriptions, but I cannot upload them right now... be sure it will be done in the next days. And thanks for your comment... I'm still surprised myself !